The assignment from Get it Scrapped! : Make a page that includes elements of nostalgic branding with the goal of achieving a look inspired by retro branding. This page is about childhood memories of my dad and his love of bowling. (he's the first one in line) The photo from 1960 set the tone for my retro layout. Looking for further inspiration, I searched Pinterest for retro bowling signs and the Silhouette Online Store for retro bowling shapes. I'm sure you're not surprised I found plenty of ideas in both places! Take a look at branding these days and you’ll see plenty of vintage or retro images, typefaces, and layouts. Retro is trendy and retro branding is aimed at offering comfort, of reminding us of a time when things were better. Since working on this assignment, I've been spotting this retro trend all over the place. You can find more inspiration and examples right here. Do you like the look? Could you find a photo or photos that would benefit from being scrapped with retro branding? This is awesome! :) Love it! This is an awesome page, Sue! You totally captured the retro feel! This is such a fun page! You did a wonderful job capturing the look of the era. Your title could have come right off a sign. Awesome job! Love it! Takes you right back! Great page! My dad used to bowl on Monday nights too! What a great challenge and layout! And actually used to bowl myself a back in my 20's. I love the retro signage and have a couple. Thanks for the ideas on how to use them! You really did. Capture the retro feel Sue! 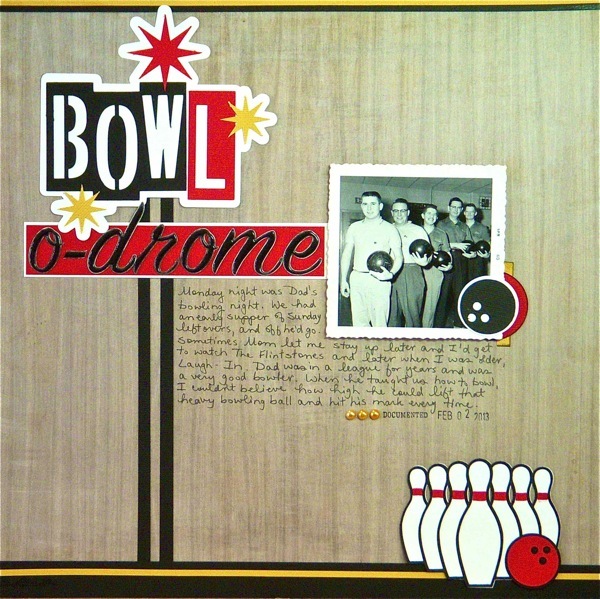 I love the retro bowling theme you used. Really awesome page, Sue!! Love the inspiration from the Retro-branding!! What a great page to honor that memory! This looks great! I love the pins on the bottom right. That page totally works for that photo. Nicely done! Wow! Great retro layout- I really like how you themed this!